Major General Paul Nanson was born in Ormskirk, Lancashire and educated at Merchant Taylor's School in Crosby. Commissioned into 3rd Battalion, The Royal Regiment of Fusiliers in 1986, he spent the next 8 years at Regimental Duty as a rifle and reconnaissance platoon commander and Adjutant, including tours in Northern Ireland, the Gulf, Bosnia, Germany and Zimbabwe. In 1996 he was fortunate enough to be seconded to 2nd Battalion, The Royal Anglian Regiment as a Company Commander both in Warminster and Cyprus. 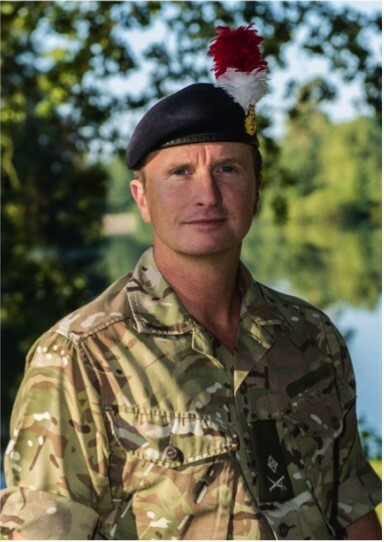 In 1998, he attended ACSC 3 at Bracknell followed by a 'black bag' job as Chief of Staff 102 Logistic Brigade during which time he took part in Exercise SAIF SAREEA and was deployed on Operation VERITAS. In 2002, he was posted to First Fusiliers in command of Y Company for a 2 year tour that included Operation TELIC 1. Promoted Lieutenant Colonel in 2004, he was posted to the Joint Services Command and Staff College as a member of the Directing Staff where he taught on the inaugural Initial Command and Staff Course (Land). In 2006, he returned to 7th Armoured Brigade and took command of First Fusiliers on Operation TELIC 7 and then saw the battalion through a Brigade training year and Operation TELIC 12. On promotion to Colonel he was posted to Herford as Chief Of Staff 1st (United Kingdom) Armoured Division from where he attended HCSC. He assumed Command of 7th Armoured Brigade in January 2011 and in 2013 deployed as Deputy Commander Regional Command (South West) in Helmand, Afghanistan. He took over as Director Army Division at the Joint Service Command and Staff College in April 2014. He was awarded a QCVS in 1996 for operations in Bosnia, made MBE in 2002 for his time with 102 Logistic Bde and CBE in 2015 for his service in Helmand. He is married to Louise (Lu) and has two young children; Milly and Henry. He enjoys cooking, hockey, walking in the Lake District and motor cycling – although he is no longer allowed to possess a motorbike!